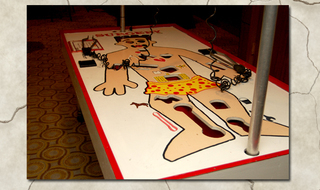 The big brother to the classic game Operation, Surgery gives players the chance to take over-sized tweezers and remove ailments from the patient. Don't hit the opening during the operation, remove the ailment successfully for a prize! Whoa! 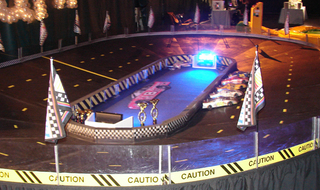 Several players take control of remotes, accelerating and steering their car around the track. Who will take the checkered flag? Challengers step up to "Ol' Bessie" and do their best to out-milk each other. 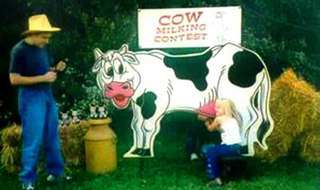 Cow Milking Contests are a top attraction at fairs & festivals, now you can enjoy it at your event without the hassle of a live cow. It can be played by one person using a timer or two contestants in "hand to hand" combat. Great for Western Themed Events! We create a real scene simulating the excitement of the video game. 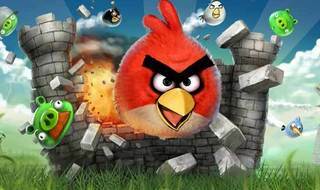 Winners get Angry Bird Promotional Items – Hats, etc. 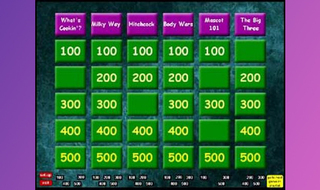 Up to four contestants at once step up to our game show set complete with electronic scoring, host, and flashing lights. Contestants answer multiple-choice questions on sports, TV, movies, prices of products and identifying popular songs. Prizes for the winners, questions can be personalized for any event! Our staff will run fun drills on the ice. Ex. best shot into a goal with a branded target, relay races with cones, and broom hockey tournament. 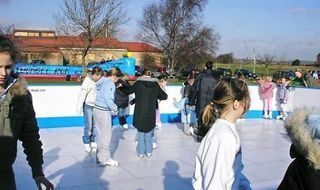 We can also set up a skate rental kiosk where participants can use skates. Your party or event guests are sure to have a good laugh with Hardrive, the five-foot fiber optic, scientific wonder that will be the hit at any party! 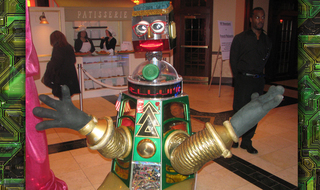 The party robot socializes with guests, sings, dances, plays music and has a great time. The Build-A-Bike team event combines community service with a brainy, challenging and fun teambuilding workshop. Your group will be divided into teams and given clues to decipher and puzzles to unlock in order to acquire the resources needed to build a bicycle. 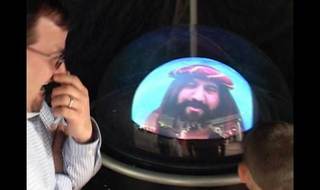 Step up to our Crystal Ball and talk interactively with our character actors! Our actors will entertain your guests by answering their questions and providing laugh-out-loud commentary. Various challenges using household items. 60 seconds on the clock. Fun prizes on the line. Think you can do it? You're In It To Win It! Great fun for all ages, friendly competition, and laughs for everyone. Check out this exciting new game that's catching like wildfire. Each participant selects a numbered crab and gives it a name. 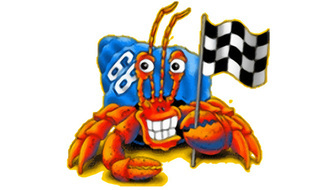 Here's how each race unfolds: The crustaceans loiter beneath an upside-down plastic salad bowl at the center of a 6-foot racing ring. Then the bowl is lifted, and crabs scatter in all directions. The first to cross the yellow ring wins! 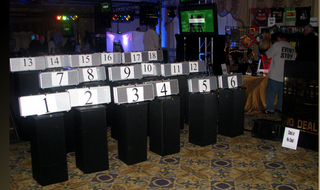 The iconic trivia game, Jeopardy!, can be brought to your next event! 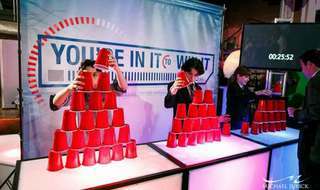 Guests compete in a test of knowledge to see who can score the most points. How fast can you change the tires on an indy stock car? 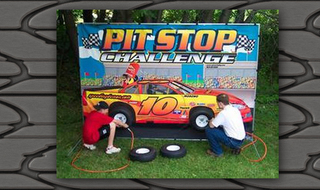 Step up to our Pit Stop Challenge and find out! 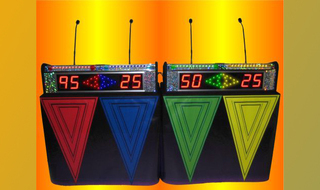 The wildly popular Deal or No Deal brought to your event for interactive fun! We provide unique, state of the art gaming lasers from Battlefield Sports, the leading global provider of Laser Tag equipment. 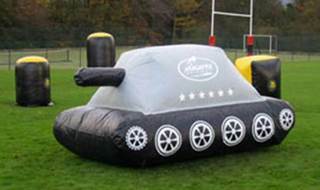 At your event, we create a paintball style scenario with multiple obstacles. Laser Tag missions are continuously run, and can take place indoors or outdoors.